A visitor may believe that a jungle cat escaped from the zoo and invaded a house if they spot a Savannah cat on someone’s premises. However, there is no need to be alarmed. This cat may look like its ancestor the serval or a cheetah, but Savannah cats are domesticated animals that may be more loving than a typical cantankerous cat. This friendly breed has a unique history and is beloved by many cat owners. The Savannah cat is a hybrid that was first produced in 1986. Judee Frank breed a Siamese cat with a serval. The serval is an African wild cat that has spots similar to a cheetahs. This medium sized, long eared wild cat was a key component in creating the Savannah. The other type of cat was always domestic but not always a Siamese. This blend of house cat and jungle cat created a beautiful breed that was instantly popular and sought after. Perhaps because of their wild cat lineage, Savannahs are a larger type of domestic cat. They have a tall build, which makes them look large, but these cats are lean and lightweight. 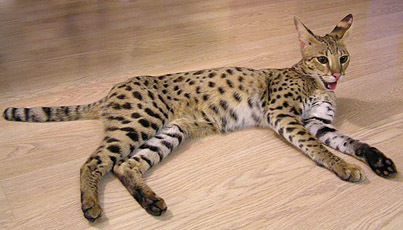 Many Savannah cats have a spotted pattern, but the pattern and color of the fur can change depending on the breed the serval was crossed with. Savannah cats all usually share wide ears, small heads, black ringed tails and cheetah like markings on the face. The backs of the ears have an eyespot, a marking that resembles an eye. The cats also have hooded eyes to protect from harsh light. Since the Savannah cat can be created with any domestic breed, there are many varieties of the cat. In today’s society, the Domestic Shorthair, Ocicat, Oriental Shorthair, and Egyptian Mau are the only permissible crossbreeds. However, some people use illegal breeds, and some Savannahs may still come from lines created with different breeds. A classification system has been initiated to differentiate between the generations of Savannah cats. An F1 denotes a Savannah cat that was bred from a serval and a domestic cat. An F1 is rare because servals will not always mate with domestic cats and complications often arise during pregnancy. F2 cats are descendants of F1s and have a serval grandparent. An F3 has a serval great-grandparent. These three types of cats are usually expensive to purchase. The price can range anywhere from $900 to over $20,000. 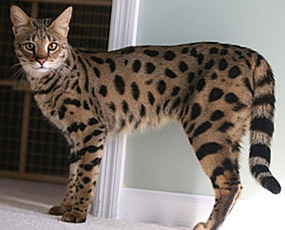 The majority of Savannah cats are SVs. They were bred by two Savannah cats. This type may cost less but can still be priced for around $1,000. Kittens are usually most expensive and prices will change based on the availability of the cats. Despite their jungle origins, Savannah cats are arguably one of the friendliest breeds. Their temperament and loyalty often remind owners of a dog. These are one of the few breeds that will play fetch and walk happily on a leash. Savannah cats can be great for families and active households. They enjoy new people and excitement. The only wild cat tendencies they possess are their ability to pounce and jump while they explore. Savannah cats are unique because they will play in water and are not afraid to get wet. Those who want a lap cat or a lazy companion should not purchase a Savannah. These cats require lots of exercise and interaction or they will become bored. The right owner will be fascinated by this intelligent cat. Savannah cats have no specific health needs, but the liver of these cats are usually smaller than average. Doctors need to be mindful when prescribing certain prescriptions. Breeders may have specific requirements for the diet and well being of their breed. The Savannah cat has an unusual history and is still rarer than many other breeds. This breed is a sight to behold and has a personality that is sweet and inviting. A Savannah cat may not be the king of the jungle, but they are the perfect companion for the king or queen of any home.